We feel strongly that this hidden crisis of “unknowing” – that we do not adequately know each other, our histories and knowledges well enough in a rich, diverse, multilingual, multicultural world – is at the core of many other crises of violence and injustice in our world. Many of us remain unseen and unheard, and this is made worse when our histories and knowledges are missing online. We also feel that the effort to change this – to re-imagine the internet, and knowledges on it – needs a multitude of us working together. So the idea for Decolonizing the Internet was born: a conference event in which “unusual” and “unlikely allies” – people who, like us, think about knowledge, the internet, or both – get to meet, talk, and scheme together to bring our different forms of knowledge onto the internet! In July, we hosted a Decolonizing the Internet conference in Cape Town as a pre-conference for Wikimania 2018. With the support of our funders, communities, and allies, we brought together a room full of dream-chasers and change-makers. We were 67% women or trans, 68% from the global south, and 77% people of color. This was the conversation we’ve all been waiting for, and these are the people whose voices need to be heard. 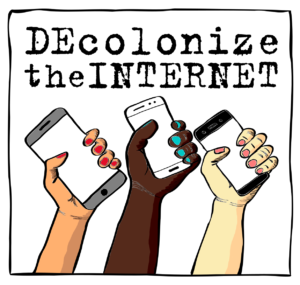 Read about #DecolonizeTheInternet (Cape Town) here!